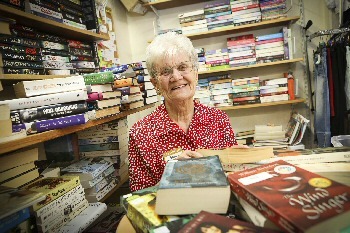 A 79 year old who re-homes 20,000 unwanted books a year has been named as a charity's top book saleswoman. Edna Harrison has raised thousands of pounds for housing body ExtraCare Charitable Trust, during her decade of volunteer work at its branch in Church Square Shopping Centre, St Helens. Her efforts include tracking down sought after novels, with a waiting list of avid readers asking for books from top authors. The gran of 9 has even been back to college to gain her English Language GCSE, picking up an A grade. Edna's passion for reading means she's now known as the Book Lady in St Helens, and for the seventh year she has been named as one of the company's top sellers. She deals with about 20,000 donated books every year, and has built up her domain into a library-like institution. The mother of 5 and grandmother of 9, who lives in St Helens, said:- "I do love my job here. I've got my own little corner and I've regular customers who come in and people who ask me to save things for them. I've even been spotted in Birmingham by a man who knew me from the shop! I'm so glad to be here and I'll be 80, in September 2015, but I'm not going anywhere. Retire? That word's not in my vocabulary." Church Square Shopping Centre manager Steven Brogan said:- "Edna is an absolute star; people come to St Helens from all over to check out her wall of books and see what treasures they can find. It's great to see the work she puts in, all unpaid, to ensure that unwanted books bring new pleasure to people. Plus the donations from people for the books means that the charity can continue carry out its excellent work." ExtraCare is a charitable trust that collects money to help fund facilities for older people in housing schemes and retirement villages across the north of England and the Midlands. Store manager Angela Connell said:- "Edna is an absolute asset to our team. She has been with us 10 years now, which is longer than I have and she totally sorts our book collection, which is now enviable for a charity shop. She goes through them all when they come in, makes sure the ones we sell are clean and not torn, divides them all up into sections and she even has a waiting list for customers who like particular styles or authors. She does it all herself and she's absolutely brilliant. She's been up there with the top sellers for the last 7 years and she always keeps an eye on that and is constantly checking her figures." Edna's love of books began at a young age and she remembers the 1st time she read the stories of Enid Blyton as a little girl. "I have loved reading all my life. My mother used to read to me and from the minute I could read myself I was hooked. I just love a really good story. My favourite book of all time would have to be Fields of Blood by Gerald Seymour. I really enjoyed that. I like watching the telly too, and films, but quite often when they make a film about a book, the book is better. I keep up with all the latest publishings too, but I'm not in to Mills and Boon; each to their own though and we do sell a lot of that. I sold a lot of Fifty Shades Of Grey too, but I didn't read it myself. I had a flick through, but I'm not really interested!" It is was pure chance the Edna ended up working at the store; she was in Church Square Shopping Centre when she saw a manager putting a notice in the ExtraCare window. Edna explained that:- "They were looking for someone to specifically take on the role of Specialist Book Volunteer so I asked if I could do it. They said I could have a fortnight trial and I've been doing it ever since. I absolutely love it. But I'm just part of the team here and we all get on so well and all do our bit." Encouraged by colleagues at ExtraCare, Edna enrolled at St Helen's College 2 years ago and did her GCSE in English Language. She said:- "I hadn't been in a school for 62 years but I loved it and I got an A. I wanted to stay on and do my A Level, but it's all too computerised now and I'm an old fashioned person." Lamenting the takeover of technology, Edna is disappointed that most of her grandchildren prefer to play computer games rather than read. She said:- "You can't beat a big shelf of proper books in a house. Going to bed with a Kindle is just not the same as going to bed with a good book." Currently on Edna's bedside table is Michael Connelly's Gods Of Guilt and when she hasn't got her nose between the pages, Edna is happy to keep an eye on programmes like Antiques Roadshow in case she ever comes across a real gem in the Church Square store, which could raise money for the trust. She said:- "I keep an eye out, but I've never found anything rare or valuable. I'd have a pretty good idea if I did, so you never know." Church Square Shopping Centre is open daily and home to a range of big name stores; such as River Island, BHS, Boots and Superdrug; along with independent retailers plus the busy St Mary's Market. Details on what's happening at the centre can be found online.